The air is cooled. Blooming crepe myrtle trees brush together their branches with the help of the breeze. The scent of September swirls about and its promises of the coming autumn’s leaves leaves one to think, though a long Summer day is very nice, how the spices of cloves and ginger and cinnamon roasting on whatever is in the oven is a lovely thing indeed as the sunsets come earlier in the evening. The beginning of fall beckons Mother Nature to spoil us with her fruits, figs crowding out the past season’s peaches, begging to be whisked to the kitchen for eating raw or for topping dessert. Though the art of baking pastry is more of a science as measurements tend to be a bit exact when it comes to flakey crusts and buttery doughs, the filling is up for creative whims. 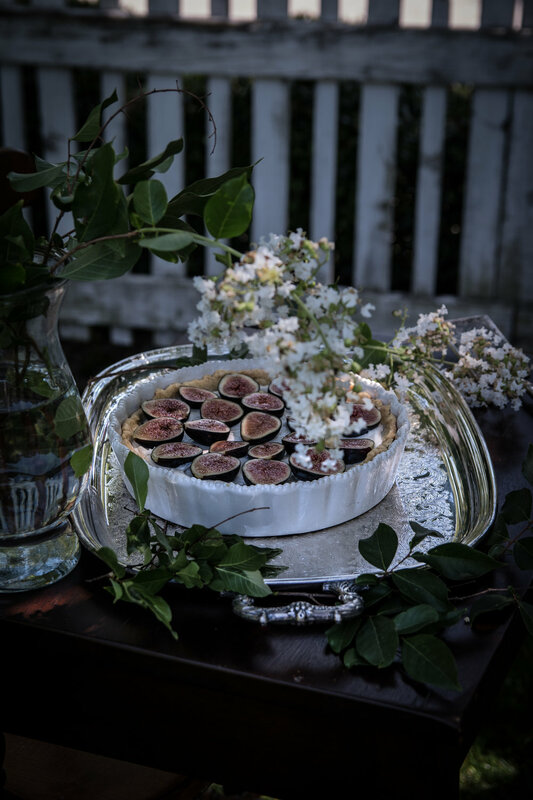 With a basket full of plump figs on the countertop waiting to be eaten, I decided to experiment with a fig tart that sports a fresh, not baked, filling. Greek yogurt and mascarpone flecked with vanilla and sweetened with honey is spooned over a just-cooled crust then topped with sliced figs and kept in the refrigerator until dessert is wanted. This treat is best made before fig season passes us by and the plump fruit begins to disappear from the market shelves. If the figs you bring home are very firm, allow them to fully ripen on the countertop before topping this dessert. For extra sweetness, you can choose to add a quick drizzle of honey on top just before serving. *Alternatively, use your favorite pie dough recipe. Place the dry ingredients for the dough in a food processor and pulse until combined. Add butter, the egg, and vanilla and pulse until it forms into a ball. Take out of the food processor and form into a disk, then wrap the dough in plastic and place in the freezer for 10 minutes. After chilling the dough, roll it out onto a floured piece of parchment. Roll the dough up onto a rolling pin, helping it along by lifting up the parchment, then roll the dough out over a buttered round 10 1/4 inch tart pan. Prick with a fork around the bottom of the crust and place into the freezer for 15-20 minutes to chill. While the dough is chilling, make the filling. Whisk the greek yogurt, mascarpone, honey, and vanilla. Cover and place in the refrigerator. After the dough has chilled for 15-20 minutes, place the tart crust into the oven, covered with parchment and pie weights to prevent the bottom from rising. Bake for 10 minutes, then remove the parchment. Return to the oven for another 25 to 30 minutes, or until the edges of the dough are just golden and the middle is dry to the touch. Remove the tart pan from the oven and allow to cool completely before adding the filling. When cooled, spoon the greek yogurt and mascarpone mixture into the cooked tart crust. Chill the tart in the refrigerator for two hours or until the filling has set. 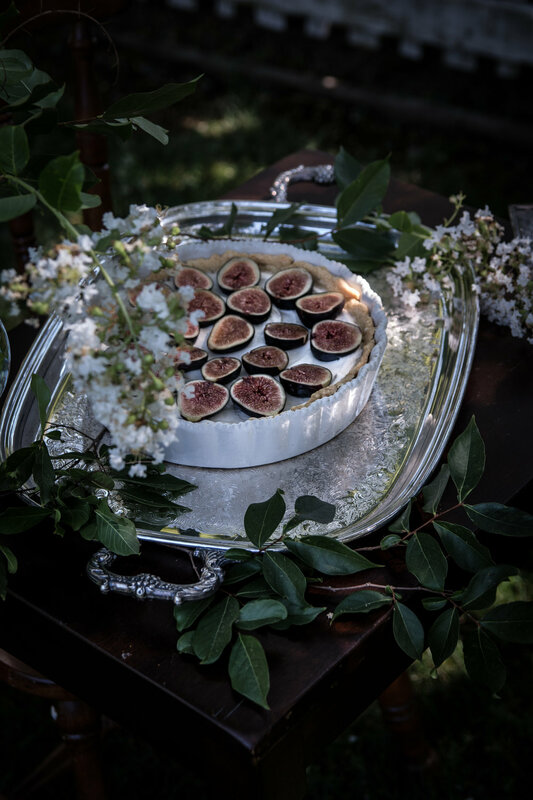 Place fresh sliced figs on top and serve.